The Humidity Switch is a simple, precise, yet rugged means to maintaining preset conditions of relative humidity in disaster management and environmental work areas. Placed between a power source and the humidification or dehumidification machine, the Humidity Switch will turn that device on or off, when a user defined preset level of relative humidity is reached. Further the switch will restart the device if the humidity level falls outside the preset parameter. 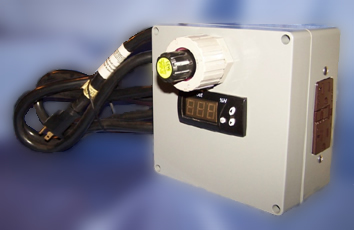 The Humidity Switch is designed for heavy duty industrial use. It is contained in a NEMA 4 enclosure that is fully sealed and gasketed. It is not position sensitive. It will operate machinery and circuits of up to 20 amperes and 120 volts AC.